We just switched up our living room rug to a beautiful hand-tufted wool rug from Rug Shop And More. 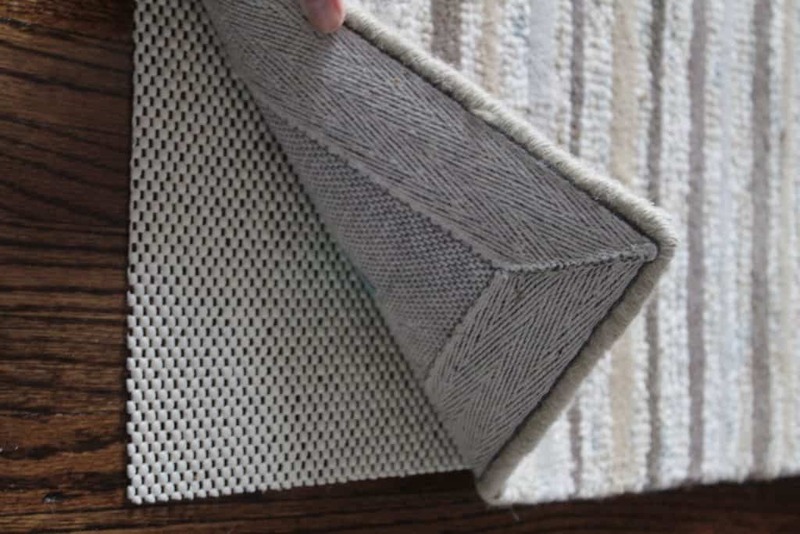 I was looking for a rug that would work well in high traffic, and not show so much dirt since we have little feet that go outside a lot. I also wanted a rug that didn’t need constant fluffing up to look its best for high traffic as well. This one was perfect! This rug from Rug Shop and More came in the mail and our first thought was how beautiful the colors were and how and thick the rug felt. It is a high-quality rug made from New Zealand wool. Very neutral, it has greens and beiges that I knew would hide dirt well in between vacuuming. And, with a crawling baby, this had an awesome amount of cushion to it with a lot of texture. Very perfect for a high traffic living room because it never gets that squished walked on appearance. The first few days we experienced a lot of shedding from the wool (which I had to keep Desmond from trying to eat), but after that, it did not shed much at all. I had never had a wool rug before so shedding was new to me. However this is very normal for a new wool rug! This wool rug shed a lot for the first couple of weeks and slowed down a lot after that. I had to vacuum every day for a while so that my baby wouldn’t eat the little wool pieces that came out. But after about one month it hardly shed at all! We love how this doesn’t show the dirt and looks really sharp in our living room. It’s also so thick and comfy to stand on. Like any rug dirt finds its way underneath, so I occasionally lift it up to sweep and have to move the rug pad under it too. Or I’ll just move the edges if I’m lazy. 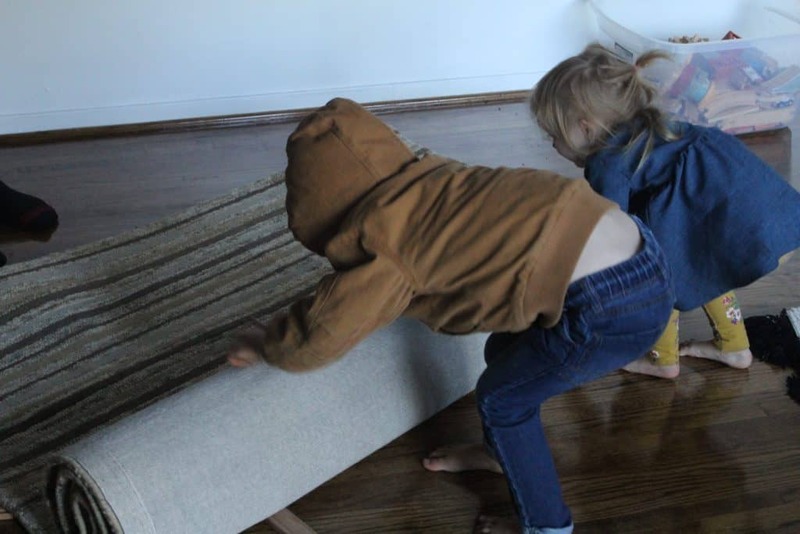 When we want to move the whole rug, we have to also move the rug pad first. 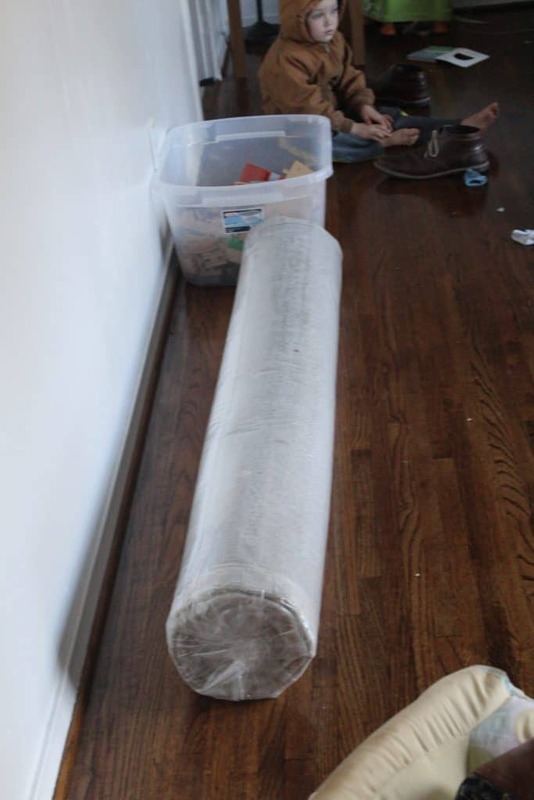 That can get tricky as rug pads stick to the floor (as they are supposed to). It’s a two man job to get the rug pad flat and straight. Still very happy with it! What I love about this rug is that it would look great in any room. Our living room is white and grey, and yet the beige/green still goes well. I could also put this in the kitchen, nursery, or office and it would blend and add warmth to our hardwood floors. So when that day comes that I want to change the look of our rooms, I can easily rotate this rug to another spot and it will go perfectly. But for now, it will stay in the living room because it is the best rug I have for high traffic! It also comes in a larger and smaller size than the one pictured which is a 5×8. This is a pretty standard must have in our house. 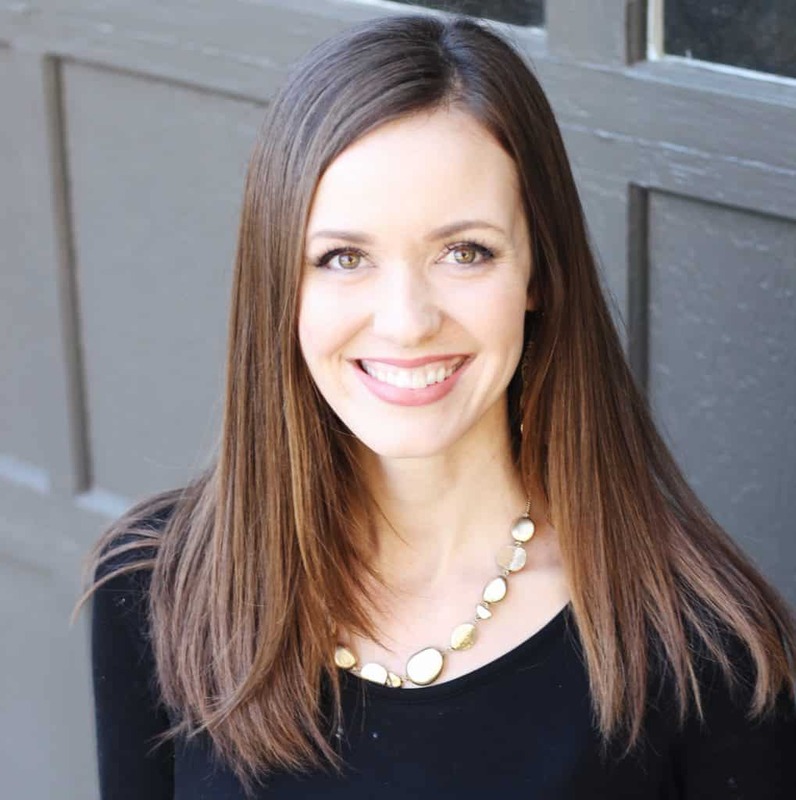 With Rug Shop And More I can get free shipping and easy returns in the USA, and their selection is HUGE! I am very pleased with this rug and it will be used for years! This rug from Rug Shop And More arrived wrapped up like this! Now that we have a crawler who bonks his head a lot, having a squishy rug to plop him on is SO nice. 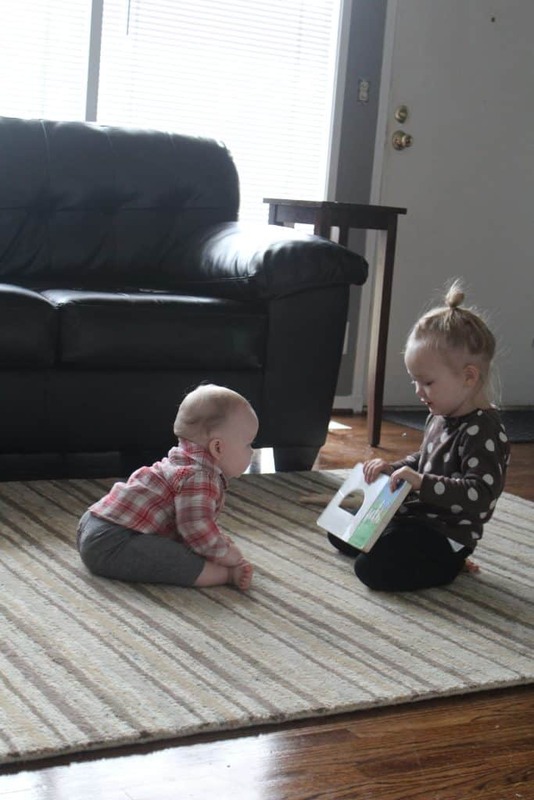 This rug is not a soft texture and is made from wool, but it is SO squishy. He can tip over and does not cry because of the cushion. The kids couldn’t wait to see what it looked like. And boy was it heavy! I highly recommend the non-skid rug pads they sell. This one makes it so the carpet stays put, and it was just the right size for the rug. We had a different rug in here originally, but it got dirty very quickly. 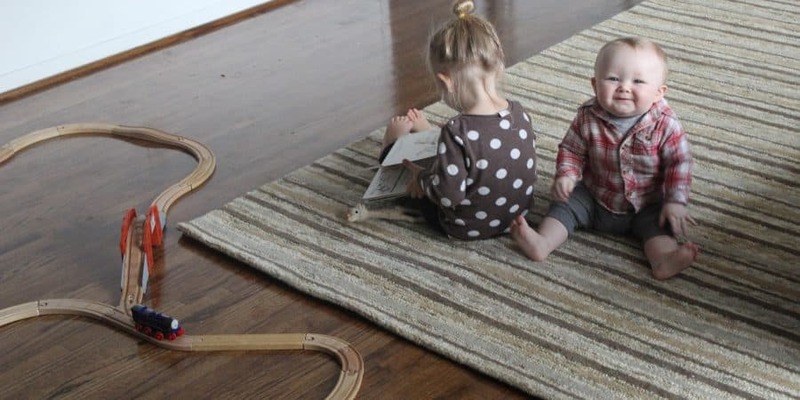 This rug doesn’t have the bright pop of color I love, but it does not show dirt! And, it does not go limp from a lot of foot traffic. No need to “fluff” it up. Ever.